IT’S PEOPLE who make programmes. I believe we now have the best team of programme makers in ITV, one of the best in the world today. And Thames’ team is getting stronger every day. Left to right: Verity Lambert (drama), Mike Wooller (documentaries), Jeremy Isaacs (Director of Programmes), Sue Turner (children’s programmes), Ian Martin (features, education and religion), Philip Jones (light entertainment), Peter Pagnamenta (current affairs). Grahame Turner (outside broadcasts) was absent for this photograph. Philip Jones OBE and Verity Lambert have already made their mark and achieved the recognition they deserve. This year we have added Ian Martin’s department’s Prix Italia to Sue Turner’s Prix Jeunesse. Next year there will be Mike Wooller’s first major documentary series for Thames, Hollywood. Peter Pagnamenta will be bringing a new look to all our current affairs programmes. And Sam Leitch, who has just joined as Head of Sport, will make his contribution to an even better programme mix from Thames. 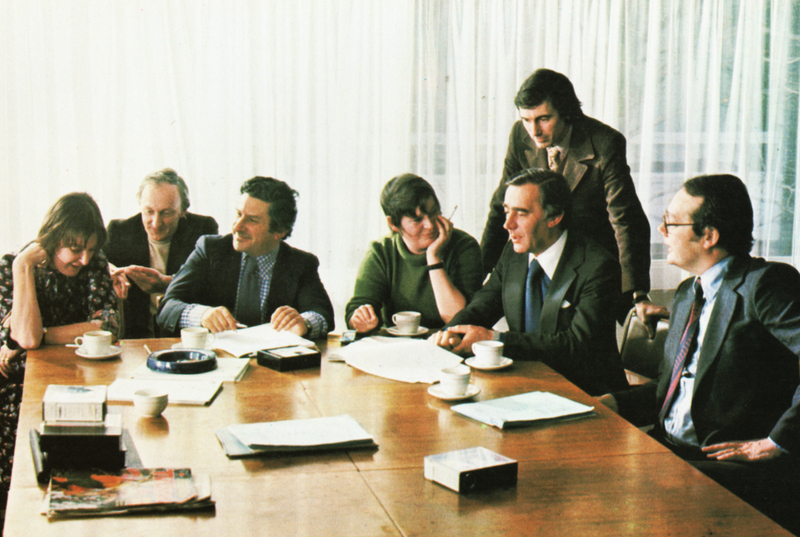 These are the people – with their production teams – who are now planning the programmes you will see in the ’80s.